Art is expanding its definition. It no longer has to be confined to a painting or a sculpture. Computers are redefining traditional artistic mediums. By combining my own original photography and photo editing software, I am able to create unique images that tell their own story. 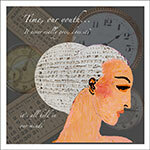 Digital art pieces are printed on fine art watercolor paper with archival inks. Sizes range from 5×7 up to 12×18. Whimsical and nostalgic collages begin with scanned images from old periodicals, vintage postcards, and any old documents that lend texture and interest. Assemblage is an artistic process that consists of creating two or three-dimensional compositions by putting together found objects. Jewelry is created from junk drawer finds including buttons, postage stamps, old costume jewelry and anything shiny that catches my eye. Greeting Cards are printed on fine art paper and are blank inside. All contents of this site are Copyright © 2015 by Mary F. Harrington, All rights reserved.